4 DVDs · 8 hrs. 38 mins. HIGH SCHOOL OR COLLEGE PRECALCULUS! Precalculus includes a wide variety of topics drawn from algebra, geometry, and trigonometry that pave the way for studying calculus. Now you can master this demanding course quickly and easily with Video Aided Instruction’s Precalculus. 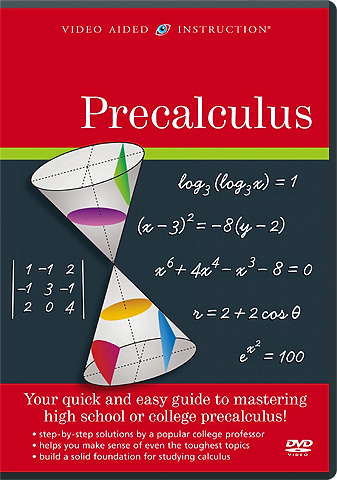 The ultimate resource for high school students, college students, and adult learners, this program covers the standard topics taught in precalculus and college algebra classes and is jam-packed with practice questions and strategies for tackling even the most challenging problems.